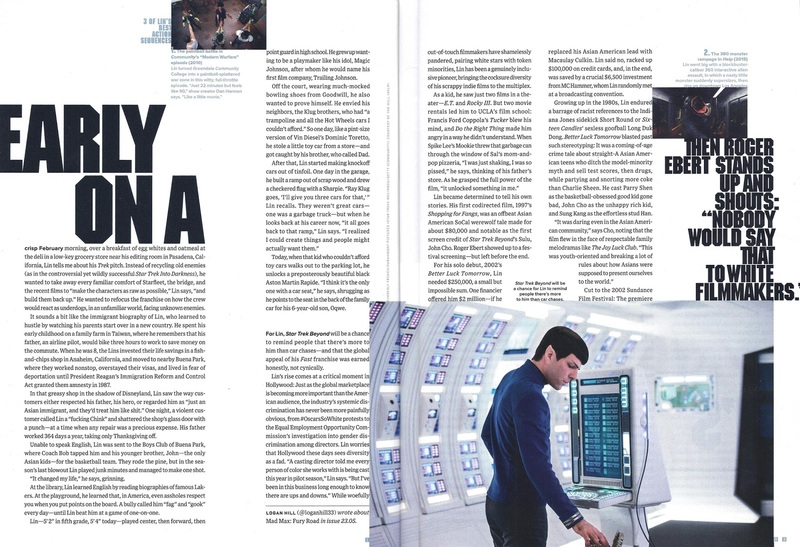 Star Trek Beyond was Justin Lins first "rebooted" Trek movie to hit cinemas in 2016 after STID and 2009. On Stardate 2263.2 Captain Kirk wrecks the USS Enterprise NCC 1701 by smashing the Federations flagship into an alien planet. Memory alpha confirms the movies villain is one badass cookie, Krall was like Director Justin Lins secret weapon designed to omaze the crowds. 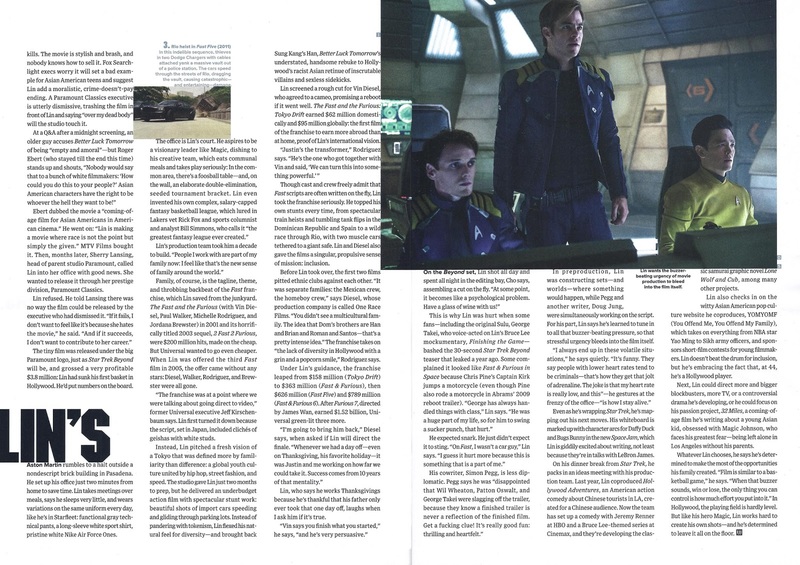 Unfortunately my friends, Krall's silence is also why Star Trek Beyond fizzled. How many of us wanted to know more about the movies villain, Krall??? Who in the galactic universe was Krall and why were his dynamic capabilities kept hidden? The big bad - Elba was perfect for playing evil Krall. The only snag was we were kept in the dark. That means us People!!! Believe me if I knew more about Krall you guys would have read all about him at Star Trek Sci Fi Blog. So blame the Star Trek Kid, Justin Lin. In any case the movies domestic release warped ahead on the 22nd July, 2016. Here was one of the main characters in the entire movie, Star Trek Beyond and very little Krall in trailers. The villain could have stirred up an increasing hotbed of emotions generating huge interest in the movies swarming conflicts and sparsely populated class M world (magnetically attracting eager fans and sweet studio profits). But do lets be honest, trekkers to warriors LET TALK about the LAST MONTH before Star Trek Beyond even hit the big screen!!! Why did Justin Lin keep Krall Top Secret? Krall's late arrival on the scene turned solid gold into ashes. 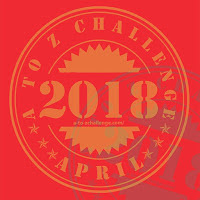 So when he said "I'm counting on it" to Lieutenant Uhura - too much time had elapsed to get an instinctive, terrified reaction from loyal fans and movie addicts. Scary words weren't enough to shrink me into my seat... 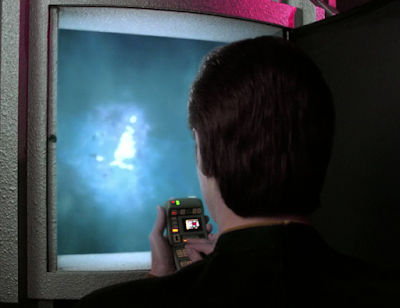 It was puzzling to gauge why Krall was scouring the Enterprise looking for this magical device. This villain didn't add a crisp new dimension which made me think alive. The USS Enterprise NCC 1701 crew's safety didn't matter much either, those guys know the drill I told myself. Krall just didn't petrify me with fear. 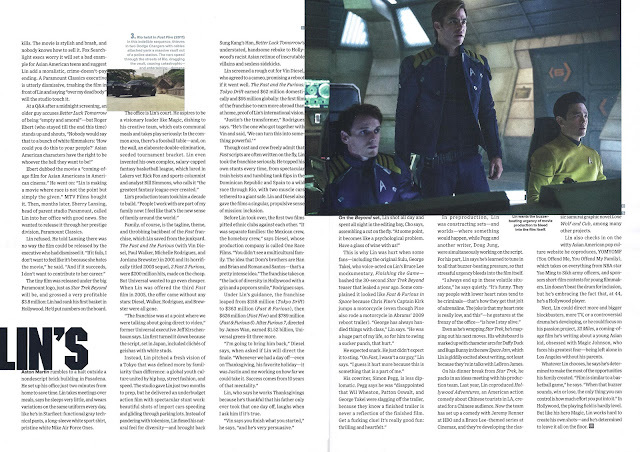 Movie fans know Star Treks former director J.J. Abrams led Star Wars to victory. Yeah, yeah yeah... cry me a river. He was Star Trek's last best hope... okay, okay enough whimpering already.... but I want to get serious for a moment, it wont take long.... wait I've changed my mind. Did you watch Star Trek Beyond? What did you think of villain Krall's marketing coverage before Star Trek Beyond's Grand Premiere? 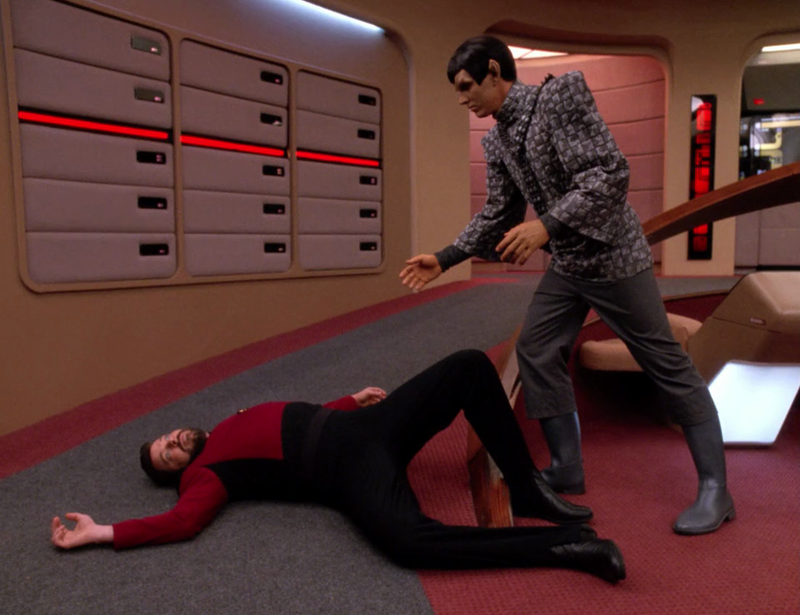 Heres Star Trek's Original Series bloopers brought to us in living colour. These classic "out-takes" were rescued from the studio floor. The shows creator Gene Roddenberry had them spliced together without telling Leonard Nimoy (12.35) or the rest of the crew. In them we see Captain Kirk kissing a beautiful blond bombshell in a red mini-skirt. All the awesomeness it took to get Star Trek TOS onto film are here. Our defender of female virtue enjoyed his job but judging from the laughs snafus just constantly happened. Skip ahead to 6mins 17secs and we discover William Shatner having a makeup meltdown. The guy spends 3 whole hours getting plastered in make-up to age Captain Kirk for Star Trek's classic "Deadly Years" and what happens? The studio doors were locked up and everyone had gone home! 'Bob Justman, I'm going home now. after spending three hours putting this fracking makeup back on.....and its your fault! First off let me apologize for the long post, Timescape is complicated. Even Captain Picard says, "Its going to take a little time to explain No 1"
In 1993 Star Trek The Next Generation's visually stunning "Timescape" episode hit our tv sets. 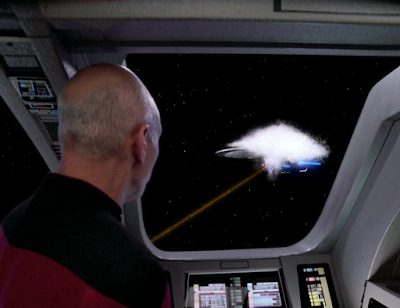 You might even remember Captain Picard's USS Enterprise NCC 1701-D, Galaxy Class Flagship exploding in outerspace! But wait.... the TV set rewinds and voila, - the Enterprise-D is - shes alive and in one piece again! Hooray!!!! So what happened? Timescape is Brannan Braga's second time travel script. "It was one of those episodes that read better on paper," laughs the man himself. Adam Nimoy directed polishing it off nicely. Getting the crew to stand motionless wasn't easy....apparently. 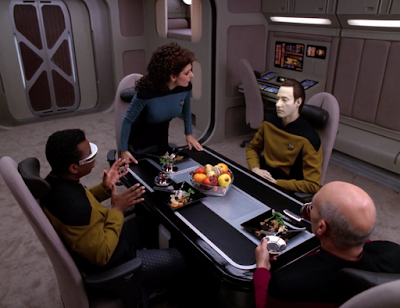 Picard, Geordi, Data and Counselor Troi are chatting after a weary conference lecturing them about the effects of Deep Space assignments. Sounds exciting doesn't it? When three shuttle crew freeze up before Deannas eyes. No-one really believes her - Its only when the freaky happens to Deanna.... Our friends have to put on brave faces but at least the open arms of home sweet Enterprise awaits. Right? The crew are shocked to discover spherical temporal disturbances affecting time in the entire region, fast and slow. After altitude restoration, Geordi reports that the shuttles starboard anti matter pod is totally drained. Data also points out that according to the plasma conversion sensor, the the pods have been in continuous use for 47 days! Except thats not all. 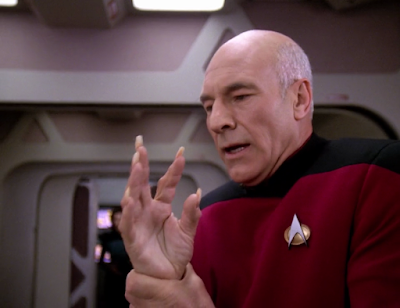 Time is moving 50 times faster which Picard realizes after touching fruit. The dude literally flips out in agony, gasping, cradling his hand gingerly. 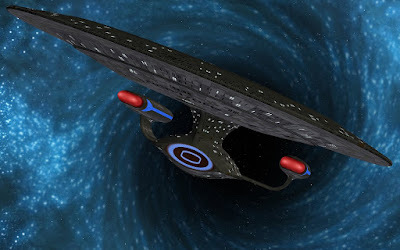 So now its time to high tail it to the safety of the Enterprise-D. The enigma deepens because the Enterprise-D is motionless facing a D'deridex class Romulan Warbird. 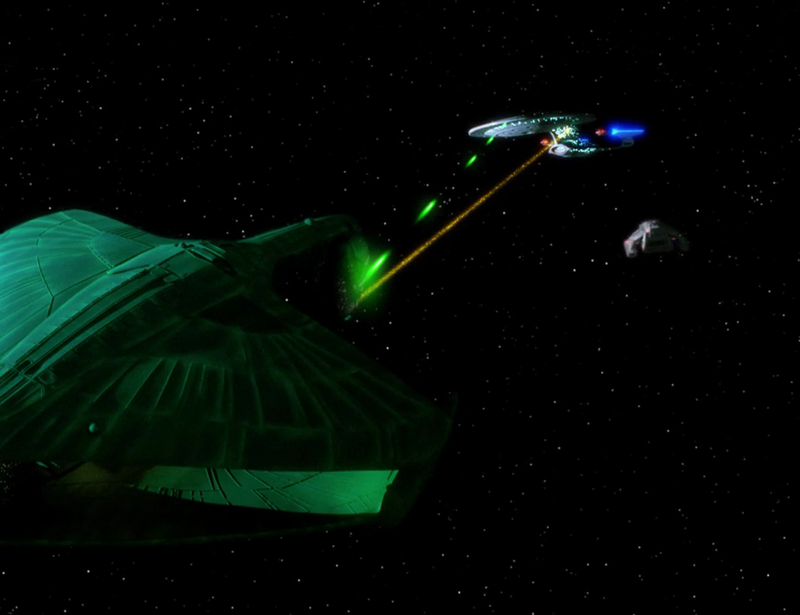 Everything about the Romulans seems wrong. 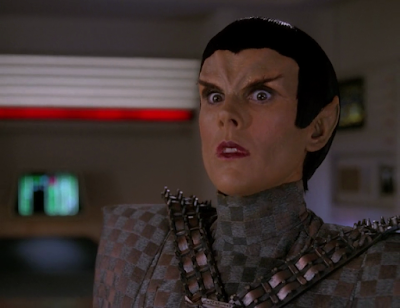 The fact is at this point in time, we're not supposed to know who the bad guys are but the beauty is they look like Romulans! To shed light on the mystery of the energy fire between both spaceships, Captain Picard's shuttle crew beam aboard his flagship to investigate. Geordi prepares frequencies on all the protective transporter time-bands, so everyones can move in the frozen timeline. When they get aboard, It turnouts that a warpcore breach is in progress. The breach will eventually consume the Enterprise at its current rate of speed in 9 hours. Picards temporal narcosis doesn't help matters which explains happy face time!!!. 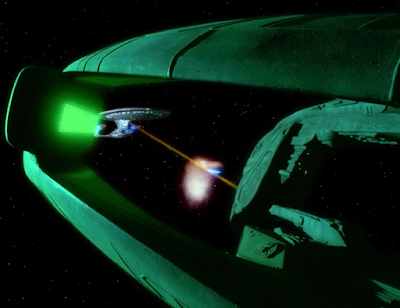 The real brainteaser is why two aliens are running about the Enterprise trying to prevent a warp power transfer to the Warbird? For reasons unknown to us these guys are from another time dimension and they've screwed up. I mean have a heart!!! Unfortunately they mistook the Romulan Warbirds engine power source as a natural quantum singularity. Duh what??? natural quantum singularity. Seriously???? In other words the aliens use "black holes" as nests for their young aliens...... Okay I think my brains were melting right about now. Unfortunately the Romulan power source was a forced quantum singularity unsuitable for any lifeforms. 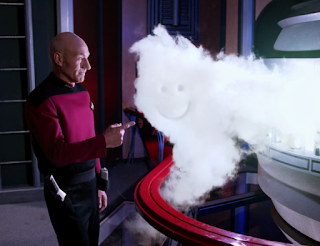 In order to restore time Picard remote controls his shuttle into the path of the energy transfer. Wasn't he clever? Who in your opinion are the bad guys? 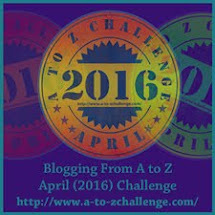 The Romulans or the Aliens? Alice Eve was Born in 1982. Our blond beauty's lovely right eye is green and left eye is blue otherwise called Heterochromia. Alice Eve has spoken about her naughty exhibitionist performance. "That was my decision. That was not something I was pushed into... 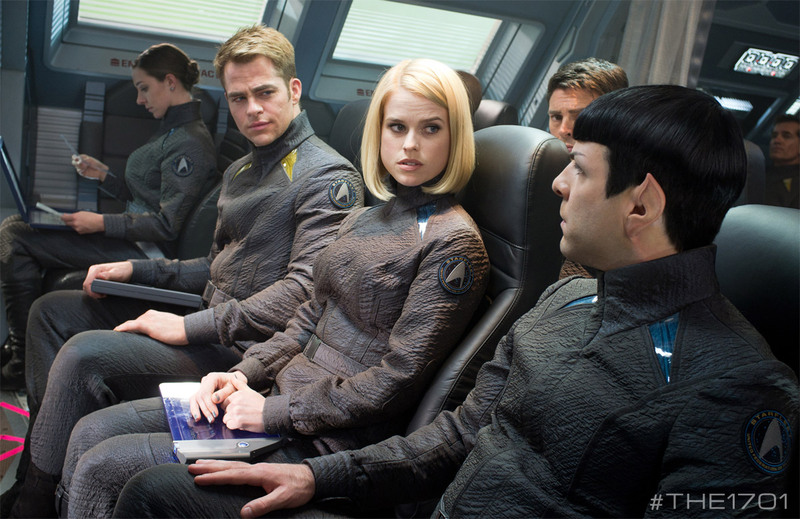 I'm sure in 30 years I'll be even more proud of it"
So why wasn't Alice Eve in Star Trek Beyond? On a sad note, well known Land of the Giants, Star Trek actor, Don Marshall passed away peacefully on Oct 30th. His daughter, son and twin brother Doug were at his bedside. He was 80. Don starred in Star Trek's classic "galileo-seven" playing the spirited Lieutenant Boma. Fans will remember him for challenging Mr Spock's insufferable logic when the shuttlecraft crash lands on planet Taurus II. We know the ion storm threw them off course but heres the thing. The G7 crew were low on fuel and had to achieve orbit. So who gets to choose? demands Boma of Mr Spock. Meanwhile the creatures were attacking! Don Marshall will not be forgotten by fans, RIP Don and thanks for making us laugh.